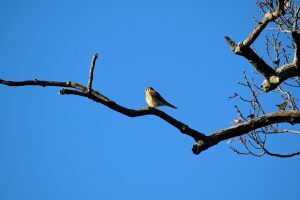 Spring is a special time for birds, and based on what we saw during the March Second Saturday Bird Walk, spring has definitely sprung at the Arboretum. Most of our resident birds are nesting now. 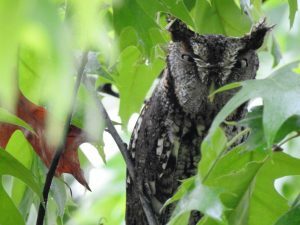 In fact, the very first bird we saw on the Bird Walk was a nesting Eastern Screech Owl! Some birds have already raised their first broods; we heard begging calls from fledgling Carolina Chickadees at our savanna restoration site. Migrant birds are also arriving from Central and South America on their long journey north. 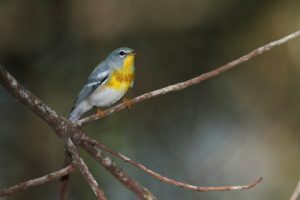 We saw plenty of Yellow-rumped and Orange-crowned warblers along the Outer Loop trail, and we heard the first Northern Parula of the year singing at the savanna restoration site. Some of our winter birds like Cedar Waxwings and American Kestrels are still lingering at the Arboretum, filling up on our abundant food before flying off to their breeding grounds. All the birds seem to be extra active at this time of year. 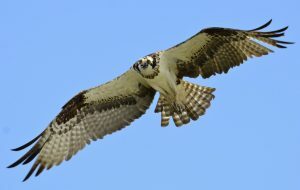 That may be why we saw two unusual birds checking out the Arboretum: a Merlin and an Osprey. Osprey photo credit Gareth Rasberry. What birds will you see this spring at the Arboretum? Keep your eyes on the sky!